Make rich and delicious creme fraiche with this easy-to-use, direct-set starter culture. 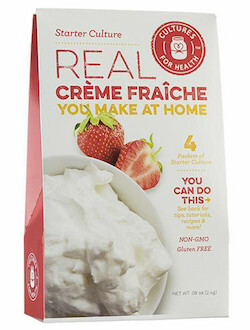 True creme fraiche is milder in flavor and contains more fat than sour cream, which gives it a thicker, richer texture. Ingredients: Lactic bacteria (lactococcus lactis supsp. lactis, Lactococcus lactis subsp. cremoris, Lactococcus lactis subsp. diacetylactis, Leuconostoc mesenteroides subsp. cremoris), organic vegetable rennet. This product is manufactured in a facility that also processes products made with soy and dairy. Gluten-Free, Non-GMO. This culture may be used with heavy cream, half-and-half or raw cream.